I recently completed my eighteenth year of pastoral ministry, having served three Covenant churches in three different conferences, including nearly six years here at Broadway. During this time, I have been amazed over and over by God’s goodness and by the faithfulness of His people. This faithfulness is expressed through worship, service and financial sacrifice, enabling the mission of Jesus Christ to move forward. To be honest, there have been years when the church I served struggled to and/or failed to meet its financial goals. Despite the generosity of many people and diligent oversight of talented leaders, sometimes the church faces money problems. I am grateful that Broadway has been financially healthy and wisely managed throughout my time here, and while we came up a bit short on our giving during 2018, our leadership had the foresight to save surplus funds from previous years. As we make our way through 2019, I trust that God will again provide for each of us and our families in ways that enable our generous support of the church. Your faithful and consistent giving throughout the year allows us to meet our obligations and plan effectively for future ministry. Broadway is a generous church, and our leaders have proven themselves, over many years, to be wise and careful administrators of God’s re-sources. Giving is a spiritual discipline, not unlike prayer, and as a discipline, our giving habits need to be rein-forced by both personal motivation and the encouragement of others. Just because we have established the dis-cipline of giving doesn’t mean we will automatically keep on giving at the level God desires. We need to re-new our commitment to stewardship and invite the Spirit again to direct how we use the resources God has blessed us with. When I introduce the offering during worship, I always read a short passage of scripture to encourage us, and one verse I often turn to is 2 Corinthians 9:7. It ends with the familiar statement, “God loves a cheerful giver.” That’s the positive side, and earlier in the verse, we read what our attitude in giving should not be: we should not give “reluctantly or under compulsion.” In other words, we give freely, openly, faithfully, cheerful-ly, and not begrudgingly or from a place of guilt or threat. You might pay your taxes reluctantly or even under compulsion (though Jesus would have us pay taxes without grumbling). You may not have a smile on your face as pay your cable bill or your property taxes. But giving to support the work of God’s kingdom should bring us joy for at least three reasons. First, God has promised to enable our generous giving. He will supply our needs, even blessing us beyond what we need, as we faithfully commit to give sacrificially to the church. 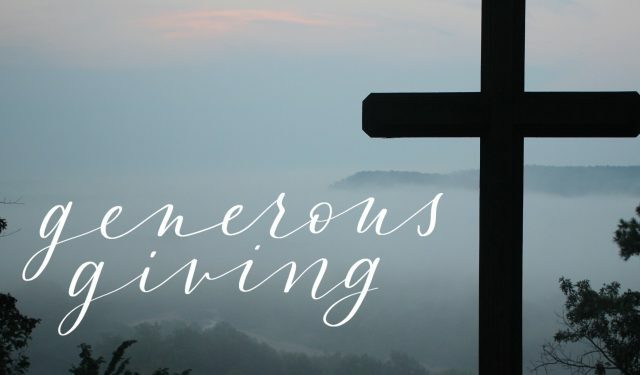 Giving is not a secret way to trick God into making you rich, but God has promised to enrich us so that we can be generous (2 Cor. 9:11). Second, our giving makes possible the advancement of our mission. Jesus called His followers to share His love and message with people in need, and while we preach the gospel free of charge and give away the good news to all who seek it, our ministry needs the fuel of financial support. Third, we can give confidently to Broadway because we know that those who manage our ministry do so with integrity and with hearts devoted to Jesus Christ. Money given to the church pays our staff, maintains our building, supplies our ministries and supports mission work. Thank you for being faithful to Jesus and generous to our church.